This is the first of a new series of post asking if you would buy a car that is up for sale. This time we are asking if you would buy the above pictured 1988 Porsche 944 Turbo S Race Car. The car is ready to take to the track and should provide plenty of performance. In case you aren’t familiar with 944 history, the 1998 944 Turbo S is a fairly rare car. The car was based on the Turbo Cup Cars, so it had even better performance than the standard turbocharged version. The asking price for all this track day fun is $10,000. Below is the description of the car for sale. Check out the full details here and then let us know if you would buy it in the comments. Five Audi customer teams are entering the Nürburgring 24 Hours with one goal, to win. The teams will be using eight Audi R8 LMS Ultra cars and they are hoping that this capable tool will lead them to victory in the famed endurance race. Last year a factory backed car took the overall victory, a first for the German car maker, and these teams are hoping to build on that success. Qualifying will start on May 17th with the actual race starting on the 19th. The 24 hour race really tests a cars reliability as well as a racing teams skill on a though track. The mid-engined sports car provides a perfect platform for a racing car. The racing designed R8s have shown to be good reliable racing cars that can keep up with the faster cars, but aren’t as temperamental as some. Audi has had a good amount of success in endurance racing in recent years and these racing teams hope for continued success. On November 20th the Nürburgring 24 Hours race will come to and end and all of these teams are hoping to be the first one to finish. The race should provide a lot of great action and we in the United States are supposed to be able to watch live coverage of the race on SPEED. Eight Audi R8 LMS ultra cars, five teams and a single aim: the next success for an Audi at the Nürburgring 24 Hours. The prerequisites, however, are different than they were a year ago, as the Audi customer teams will now be competing with their own sponsors and driver squads – supported by Audi Sport customer racing. In May 2012, Audi celebrated the first overall victory at the Nürburgring 24 Hours. As a factory-backed team, Audi Sport Team Phoenix won for Audi with Marc Basseng, Christopher Haase, Frank Stippler and Markus Winkelhock. Since then, various racing versions of the Audi R8 have won three other 24-hour races – at Spa (B) and at Zolder (B), plus the GT class at Daytona (USA) in January 2013. On May 19 and 20, the teams will be running at the Nürburgring under different circumstances than a year ago. In the fifth year of the globally successful customer sport program with deliveries of more than 100 race cars, the spotlight is on the customers. Ernst Moser’s squad which was victorious last year is competing as Team G-Drive Racing by Phoenix now. Last year’s winners Frank Stippler (D) and Markus Winkelhock (D) are joined by the Le Mans winners Marcel Fässler (CH) and Mike Rockenfeller (D) as team-mates. The second cockpit will be shared by five-time Le Mans winner Frank Biela (D), Luca Ludwig (D), Christer Jöns (D) and Roman Rusinov (RUS). A third car fielded by Phoenix Racing will be driven by Michael Ammermüller (D), Frank Stippler (D) plus Johannes and Ferdinand Stuck (A). Peter Mamerow’s outfit, the 2012 runner-up, like the Belgian Audi Club Team WRT, is returning to the Eifel track. Christian Mamerow (D), Thomas Mutsch (D) and René Rast (D) are sharing the cockpit in the Prosperia C. Abt Team Mamerow with last year’s winner Marc Basseng (D). The Belgian WRT squad has last year’s winner Christopher Haase (D) in its ranks, supported by the two-time Bathurst winner Christopher Mies (D). On board as well are Edward Sandström (S) and Laurens Vanthoor (B), who decided the Zolder 24 Hours in their favor last year. The Twin Busch team of Dennis and Marc Busch (D) will be contesting the Eifel marathon in an Audi R8 LMS ultra for the first time together with Manuel Lauck (D). The Audi race experience completes the line-up. The two race cars will be shared by talented and motorsport-experienced Audi customers with pros such as the three-time Le Mans winner Marco Werner (D), ex-DTM driver Rahel Frey (CH) and the former Formula 1 race driver Alex Yoong (MAL). All eight Audi R8 LMS ultra cars will be running in the current FIA-homologated 2013 technical specification. The exterior rear-view mirror, which is more favorable in terms of aerodynamics, the suspended rear wing and the optimized exhaust system are new features. A balance-of-performance rating of the 33 GT3 race cars of all seven brands and the other entrants is still pending. In total, entries for 179 race cars have been submitted for Germany’s biggest race. On television, Sport1 will air live coverage of the race for around 19 hours. A YouTube channel and Fan TV, which can be received on location by DVB-T, will cover the event as well. In 2012, ten national television channels carried 97 reports about Audi’s victory with total air time of 19:17 hours and a theoretical reach of 8.1 million viewers. In addition, there were 70:29 hours of international coverage by 163 channels. As you probably know already, this year Porsche celebrates 50 years of the 911. The legendary rear-engined sports car has had quite a history of success in racing. Thanks to it’s rear weight bias the cars have a lot of traction coming out of corners and in the hands of a skilled driver some amazing things can be done with the car. This video shows a celebration of the 50 years of the Porsche 911 using 38 GT3 Cup cars. The event was put on by the Porsche GT3 Cup Challenge Brazil and the video features some great footage of the cup cars on the track as well as all the work that went into the celebration. The 38 cars are lined up to spell out a message, so checkout the video to see just how they did it. Porsche has made some great racing cars based off the 911. Cars such as the 935 Turbo and 911 Carrera RSR are legendary racing machines. 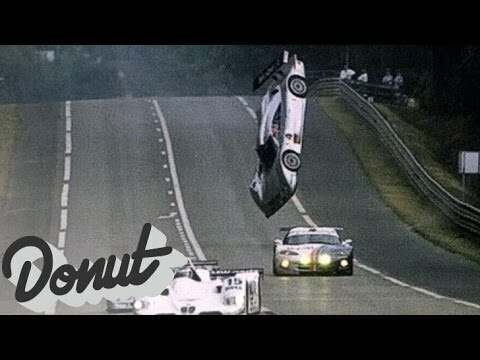 The rear weight bias gives the famed German sports car unique handling that makes it possible to do some incredible things when in the hands of a skilled driver. This video captures some great Porsche race cars driving in a Hill climb event in Switzerland. The cars on the video include everything from 911 based cars like a Porsche 935 Turbo, a 911 Carrera RSR, a 997 GT3 RS to a 914 and a 944 Turbo. If you enjoy racing and Porsches this video will probably have a lot of cars that you will enjoy watching.